While KeyRemap4MacBook implies that it only remaps keys for MacBooks, the truth is that it remaps keys for all Macs. Contained in a rough, spartan interface is a wealth of key remapping power. Covering the entire set of remaps that KeyRemap4MacBook can do would be a giant list that would be about as friendly as the software's interface. Of particular interest are the Emacs and vi bindings. If you've become particularly comfortable with either text editors key bindings, you may find it frustrating to be unable to use them elsewhere. 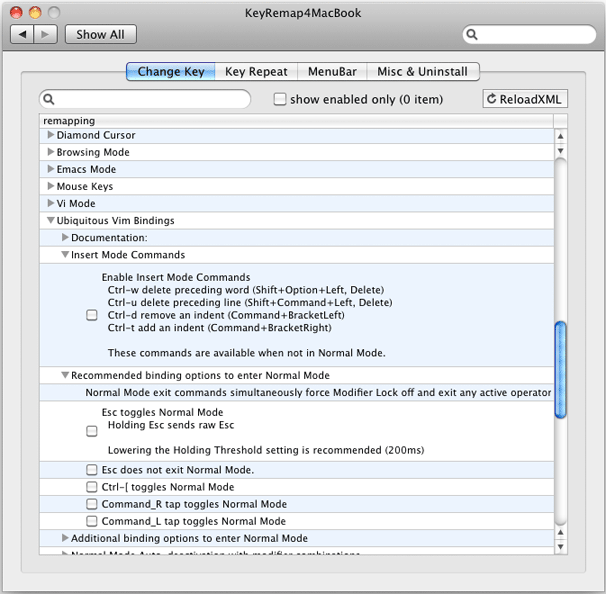 KeyRemap4MacBook features built-in remaps to allow you to use traditional vi and emacs bindings anywhere in Mac OS X. You'll once again be able to navigate text with the "hjkl" keys. The primary way these are enabled are by designating one of your modifier keys (say your left command or control key) to indicate that you'll be using those keys for navigation. While that may be sufficient for some vi addicts, there is a stronger version that enables all the vi commands you've become accustomed to in Ubiquitous, Complete, and Simultaneous vi modes. Each has their own set of rules for operation, such as remapping "/" to command-f to do a find in Ubiquitous mode. Activating and deactivating these modes of operation are accompanied by a Growl alert. For those that believe that the modifier keys (control, command, and option) are in a bad place for efficient keyboard operation, KeyRemap4MacBook even sports a way to remap tab and caps lock to these keys. It can even disable the ability to change the LED in the caps lock key (to remove a delay it introduces) and alter the timing of key repetition. KeyRemap4MacBook is without a doubt a powerful piece of key remapping software. However, that power comes with a rather intimidating, often difficult to understand interface. It can be rewarding if you find that one key binding you've been searching for.